You Can Do It! 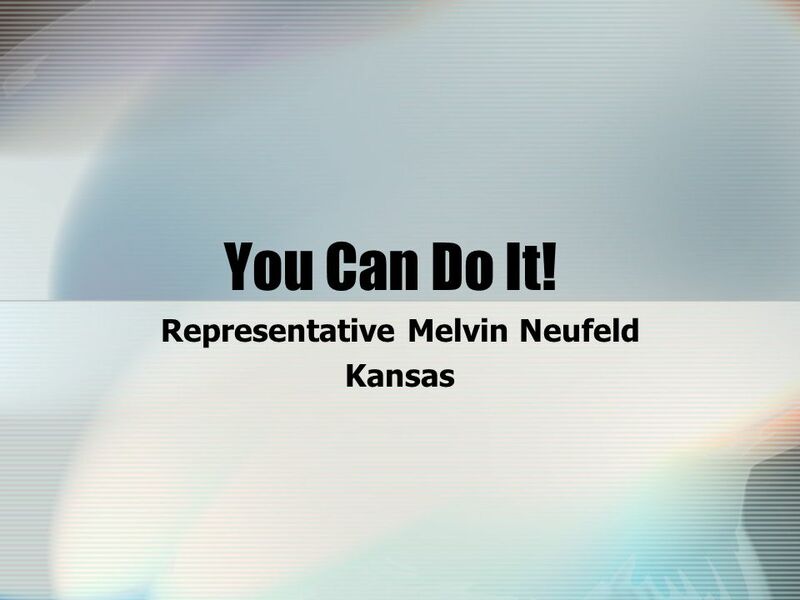 Representative Melvin Neufeld Kansas. 2 Look to the Future What will the Healthcare System look like? 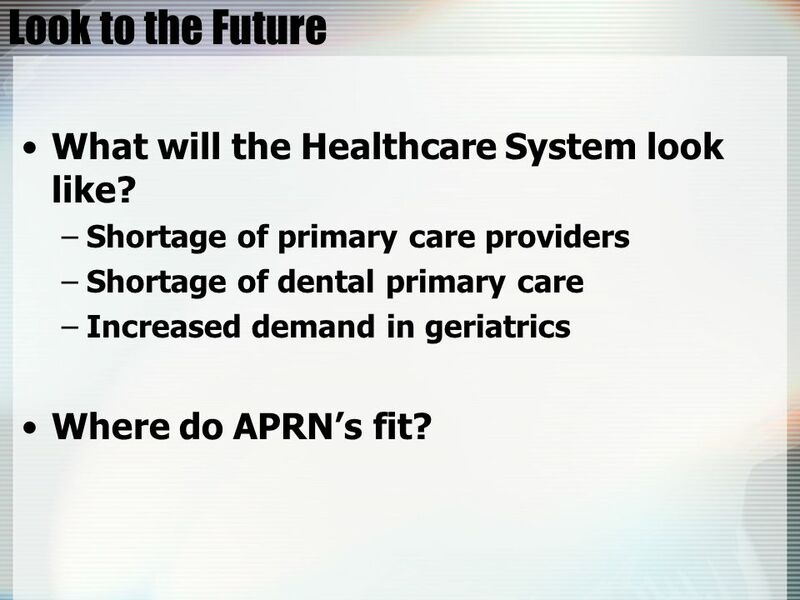 –Shortage of primary care providers –Shortage of dental primary care –Increased demand in geriatrics Where do APRNs fit? 4 How do you get there? 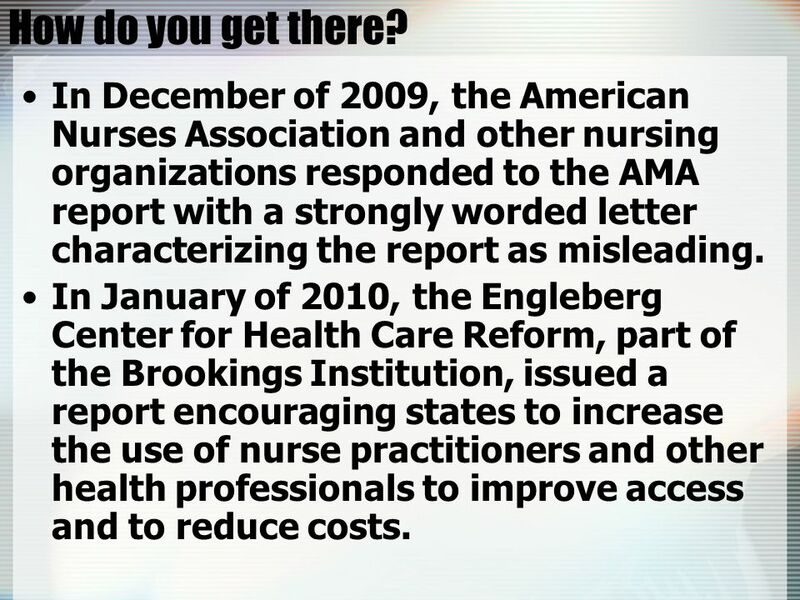 In December of 2009, the American Nurses Association and other nursing organizations responded to the AMA report with a strongly worded letter characterizing the report as misleading. 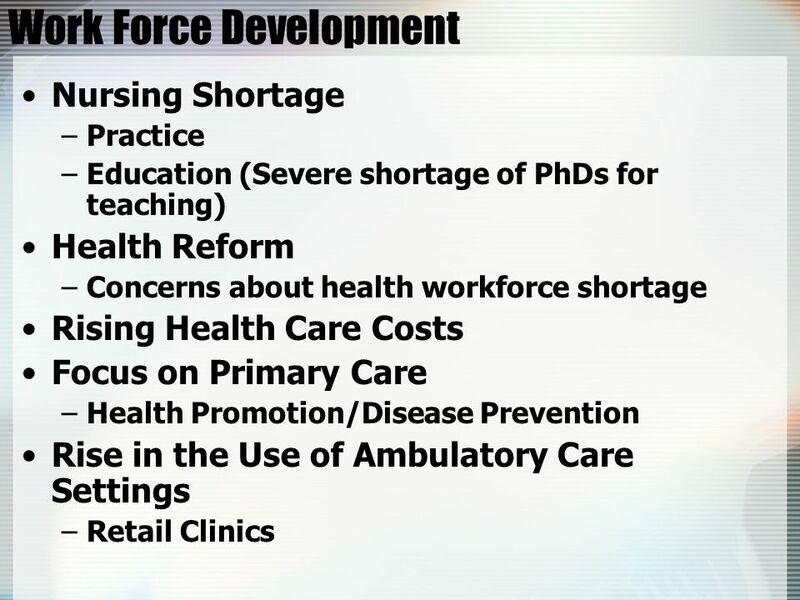 In January of 2010, the Engleberg Center for Health Care Reform, part of the Brookings Institution, issued a report encouraging states to increase the use of nurse practitioners and other health professionals to improve access and to reduce costs. 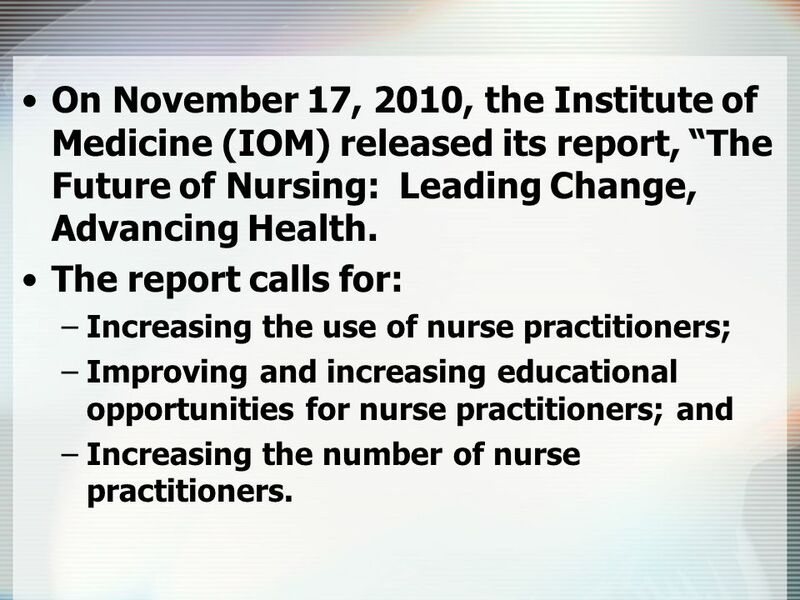 5 On November 17, 2010, the Institute of Medicine (IOM) released its report, The Future of Nursing: Leading Change, Advancing Health. The report calls for: –Increasing the use of nurse practitioners; –Improving and increasing educational opportunities for nurse practitioners; and –Increasing the number of nurse practitioners. 6 Nurses should: –practice to the full extent of their education and training. –achieve higher levels of education and training through an improved education system that promotes seamless academic progression. –be full partners, with physicians and other health professionals, in redesigning health care in the U.S. Effective workforce planning and policy making require better data collection and an improved information infrastructure. 7 Remove scope of practice barriers. Expand opportunities for nurses to lead and diffuse collaborative improvement efforts. Implement nurse residency programs. 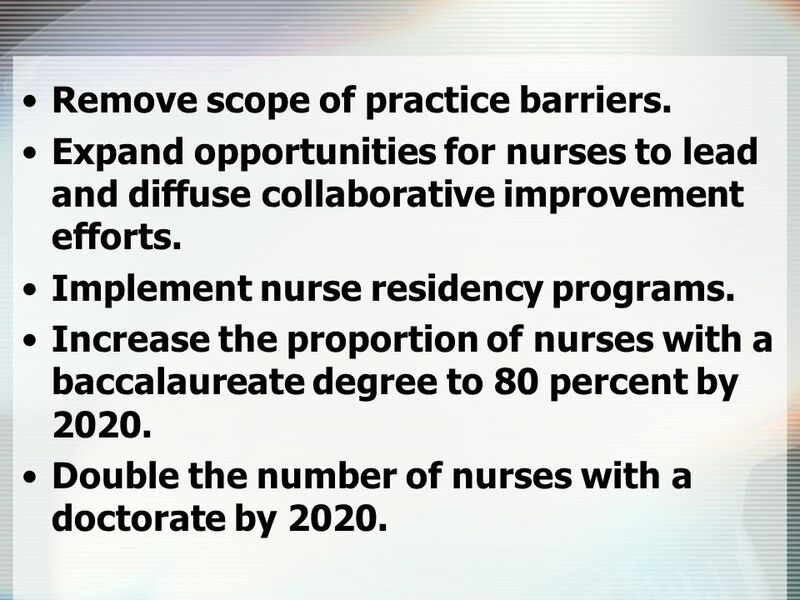 Increase the proportion of nurses with a baccalaureate degree to 80 percent by 2020. Double the number of nurses with a doctorate by 2020. 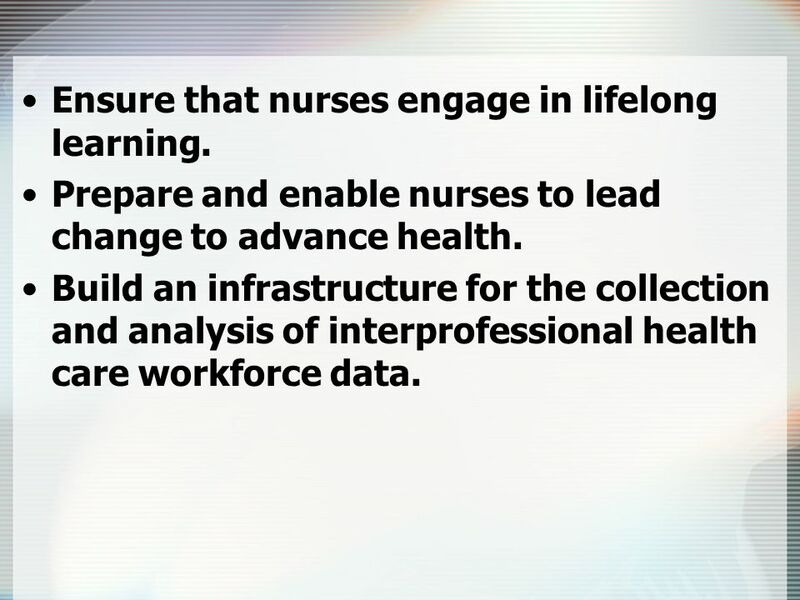 8 Ensure that nurses engage in lifelong learning. Prepare and enable nurses to lead change to advance health. Build an infrastructure for the collection and analysis of interprofessional health care workforce data. 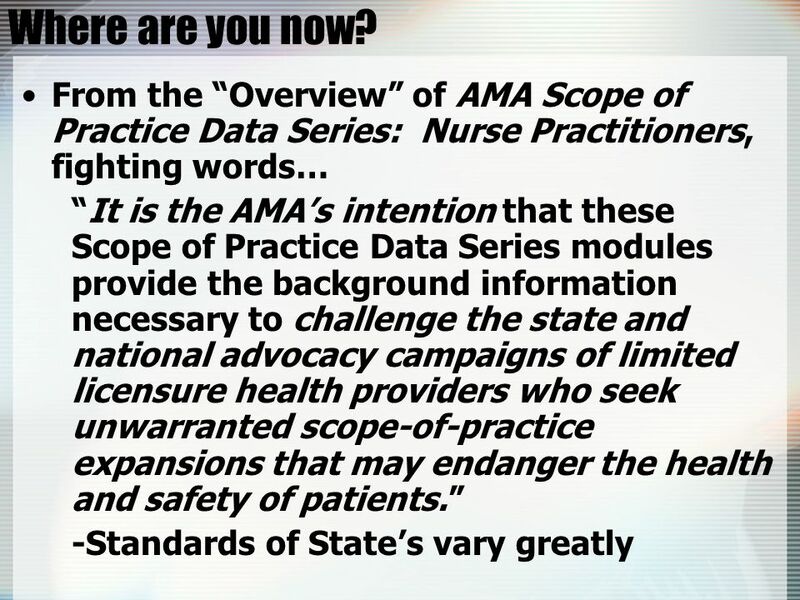 9 Current State of Affairs Physician Supervision - Diagnosing/Treatment –According to the Pearson Report, with respect to diagnosing and treating, states are almost evenly split between those which require no physician involvement (23 states and the District of Columbia) and those which require written documentation of physician involvement (24 states). 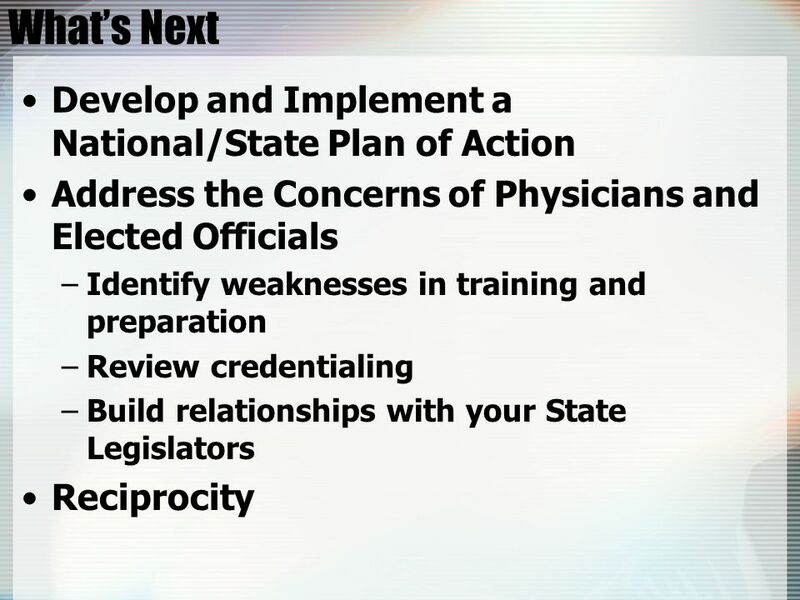 Four states require physician involvement, but do not require written documentation of a relationship. 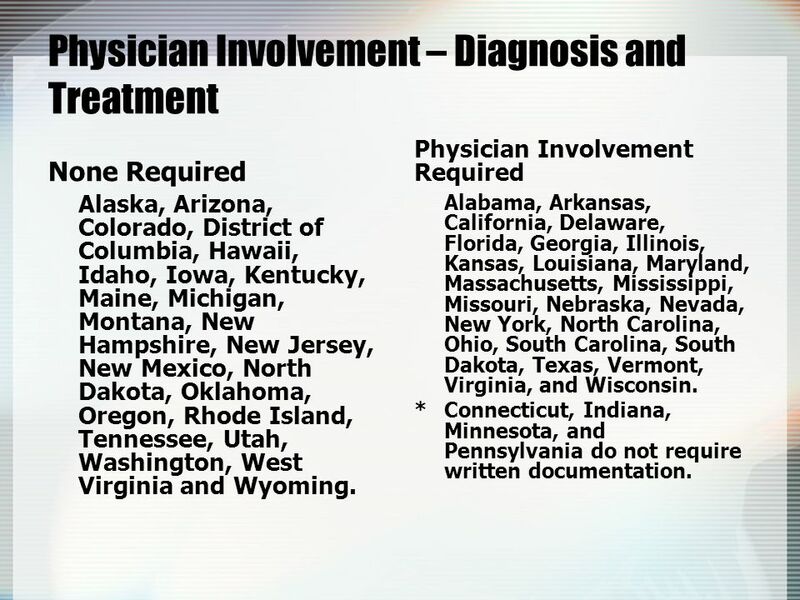 10 Physician Involvement – Diagnosis and Treatment None Required Alaska, Arizona, Colorado, District of Columbia, Hawaii, Idaho, Iowa, Kentucky, Maine, Michigan, Montana, New Hampshire, New Jersey, New Mexico, North Dakota, Oklahoma, Oregon, Rhode Island, Tennessee, Utah, Washington, West Virginia and Wyoming. Physician Involvement Required Alabama, Arkansas, California, Delaware, Florida, Georgia, Illinois, Kansas, Louisiana, Maryland, Massachusetts, Mississippi, Missouri, Nebraska, Nevada, New York, North Carolina, Ohio, South Carolina, South Dakota, Texas, Vermont, Virginia, and Wisconsin. *Connecticut, Indiana, Minnesota, and Pennsylvania do not require written documentation. 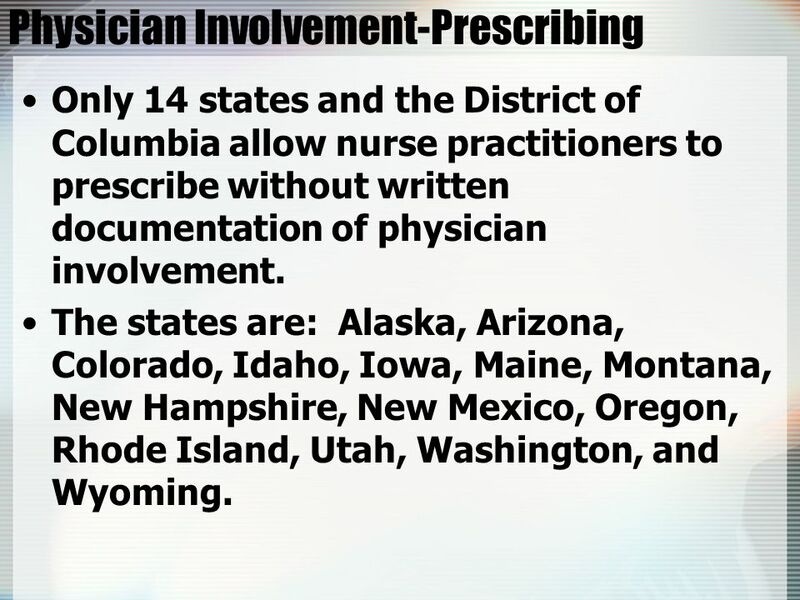 11 Physician Involvement-Prescribing Only 14 states and the District of Columbia allow nurse practitioners to prescribe without written documentation of physician involvement. The states are: Alaska, Arizona, Colorado, Idaho, Iowa, Maine, Montana, New Hampshire, New Mexico, Oregon, Rhode Island, Utah, Washington, and Wyoming. 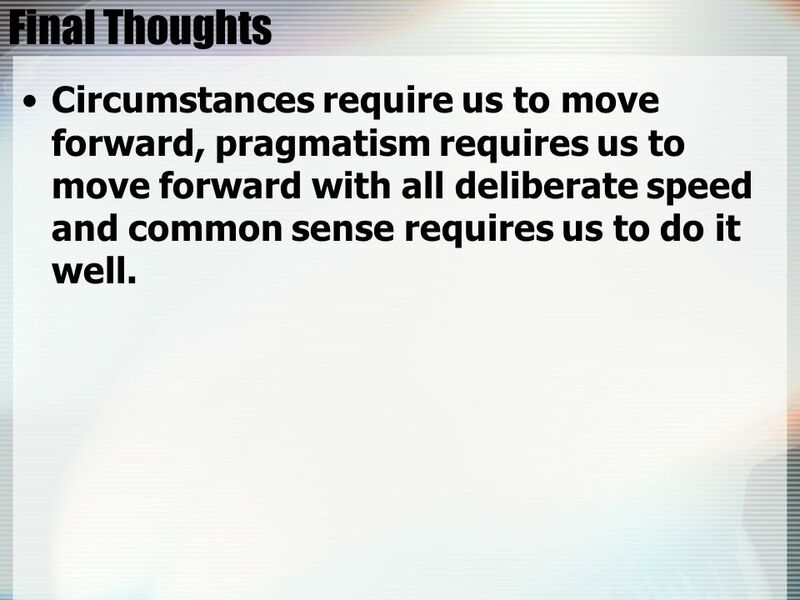 14 Final Thoughts Circumstances require us to move forward, pragmatism requires us to move forward with all deliberate speed and common sense requires us to do it well. Download ppt "You Can Do It! 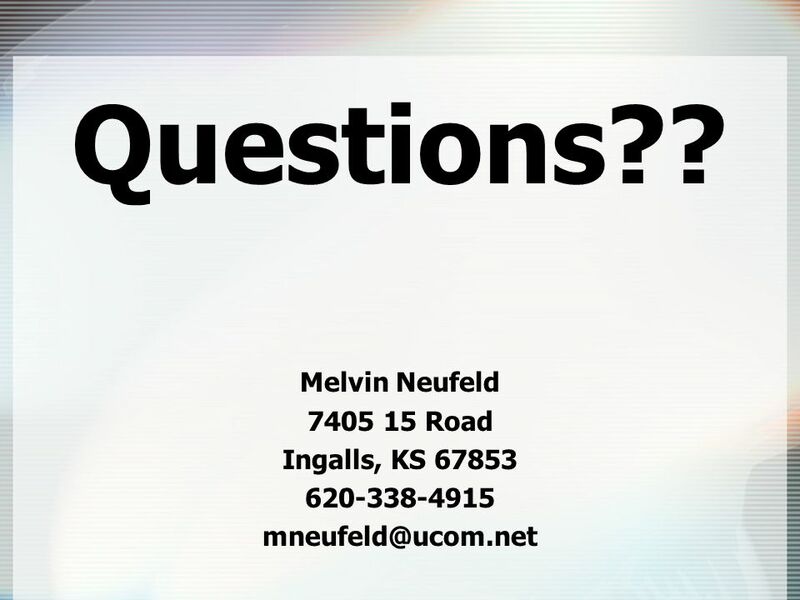 Representative Melvin Neufeld Kansas." U.S. States Abbreviations Directions: Type the state abbreviation in the box on each slide. “The English language website where everything. PARTISAN CONTROL AND STATE DECISIONS ABOUT OBAMACARE FULL GO STATES (n = 22) Arkansas Michigan CALIFORNIA MINNESOTA COLORADO NEVADA CONNECTICUT New Hampshire. Exhibit 1. Premiums and Premium Increases, Single Coverage, by Metal Tier and State, 2014–2015 Premium increases, 2014– premiums for 40-year-old. Becky Baumann Commercial Services Group. Contractual agreement Solid documentation Different type of obligation. Healthy Mouth Healthy Body Oral Health Florida 2012 National & State Best Practices Conference August 23-24, 2012. Prevalence of Self-Reported Obesity Among U.S. Adults, by Race/Ethnicity and State, Definitions  Obesity: Body Mass Index (BMI) of 30 or higher. Q Homeowner Confidence Survey Results Feb. 18, 2009. Education, Equality, and National Citizenship Goodwin Liu Boalt Hall School of Law adapted from Education, Equality, and National Citizenship, Yale Law. BINARY CODING. Alabama Arizona California Connecticut Florida Hawaii Illinois Iowa Kentucky Maine Massachusetts Minnesota Missouri 0 Nebraska New Hampshire. East of Mississippi River West of Mississippi River States starting with an M States with major waterways Warm States Easy 10 Not bad 20 Average 30. Medicare Advantage Enrollment: State Summary Five Slide Series, Volume 2 July 2013.